Khalifah was kind and warm and wanting to spread a message of health and peace through a traditional Senegalese spiced coffee called Café Touba. It’s coffee blended with cloves—to balance out the intensity of the caffeine—and African pepper (Uda Djar)—to clear your throat and settle your stomach. A devout Muslim, Khalifah learned of the drink through his guide in the Sufi order. Café Touba, the name of the drink and of his business, was invented by spiritual leader Cheikh Ahmadou Bamba, who also founded the holy city of Touba, Senegal. He stood for pacifism, reverence, and hard work. Khalifah and me in front of a photo of Cheikh Ahmadou Bamba, creator of the coffee blend. I met Khalifah and his wife at a farmers market in Phoenix, Arizona. At their stand, we jammed about the deep impact food can have beyond filling our stomachs. It was one of those conversations where you each “get” what the other is trying to do. Personally, my body is really sensitive to caffeine. Now and again, I trick myself into thinking I can handle a cup of black coffee or a double-shot espresso beverage. And every time, without fail, my limbs begin shaking as if charged with electricity that has that nowhere to go. I count down the hours until the feeling wears off. For this reason, I was excited (and hesitant) to try Café Touba. 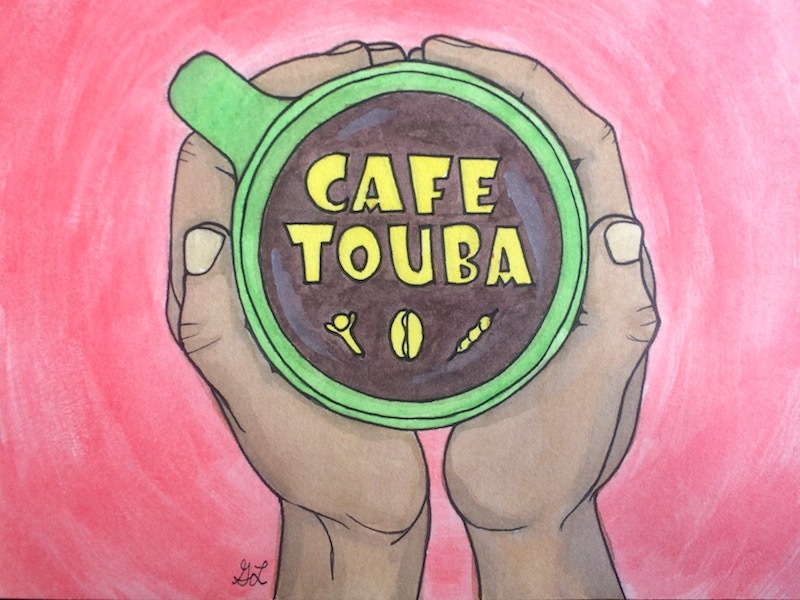 I bought a cup after Khalifah explained that he and his wife had also shied away from coffee—especially because it exasperated his wife’s health problems—but they found Café Touba to have an opposite, healing effect. Upon first taste, it was wonderful. Its flavors are full and nuanced, and the finish is smooth. But the real test was how I’d feel at the bottom of the cup. Coffee in hand, I walked around the market, talking to passionate producers of tamales, hot sauce, and aquaponic veggies. I finished my rounds, as well as the coffee, and checked in with my body. It felt abuzz—but not the trapped-by-caffeine kind of buzz. No, my body and mind were on fire from spending a morning with people like Khalifah who pour their hearts into food and drink they believe in, that represent the values they wish to see in the world. Khalifah’s coffee communicates health and peace. My body and my mind are so thankful for him sharing it. What values do you want to communicate through your food?